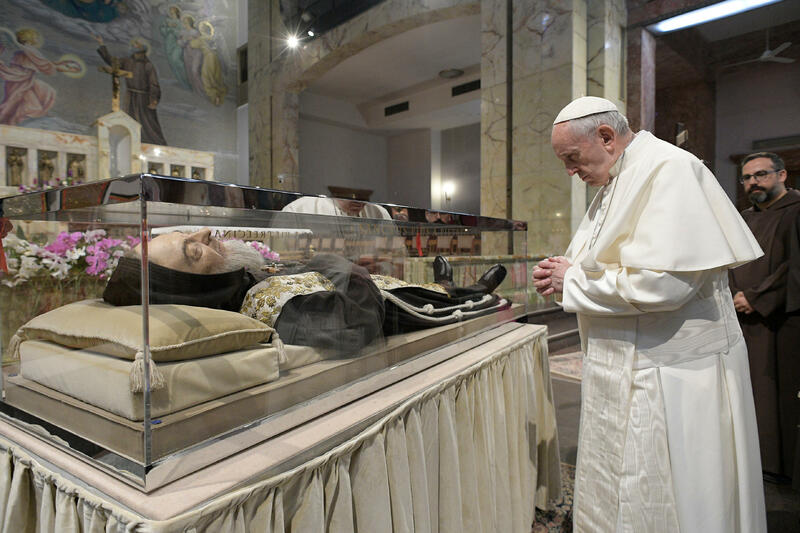 Pope Francis on March 17, 2018, visited the early remains of St. Padre Pio as part of his visit to Pietrelcina and San Giovanni Rotondo, the places most associated with Saint Padre Pio. The Holy Father visited the Shrine of Saint Mary of Graces where he was received by the provincial Minister of the Capuchins, Fr. Maurizio Placentino, the guardian Fr. Carlo Laborde, and the rector, Fr. Francis Dileo. In the Shrine the Pope greeted the religious Community of the Capuchins and venerated the body of Saint Pio of Pietrelcina and the Crucifix of the Stigmata, leaving as a gift a stole for the Exposition; he subsequently met with and greeted those Friars who were sick, before finally proceeding to the Saint’s room.